The Doctor has his trademark tools such as the sonic screwdriver and the eponymous TARDIS and we have our tools of the trade, the rock hammer and our hand lens. Both sets of tools allow us to be time travelers much in the same way that the Doctor uses his TARDIS. Instead of flying around in a blue box though, our travels take place through the history that is set in the earth’s stratigraphy, or the multiple layers of rock whose deposition records the conditions of that location at a point in history. OK, so maybe there’s some hyperbole and pomp in the previous statement. After all, we’re not the only scientists whose work spans millions and, in some cases, billions of years of time. Astrophysicists and astronomers work on scales that start 14 billion years ago with the Big Bang. However, as my friend Jamie pointed out, what makes geology unique is that we get to physically interact with our 3 billion year old rocks. We can touch them, examine them with our hands lens and chip at them with our hammers. And, if you’re feeling particularly old school, you can taste them. 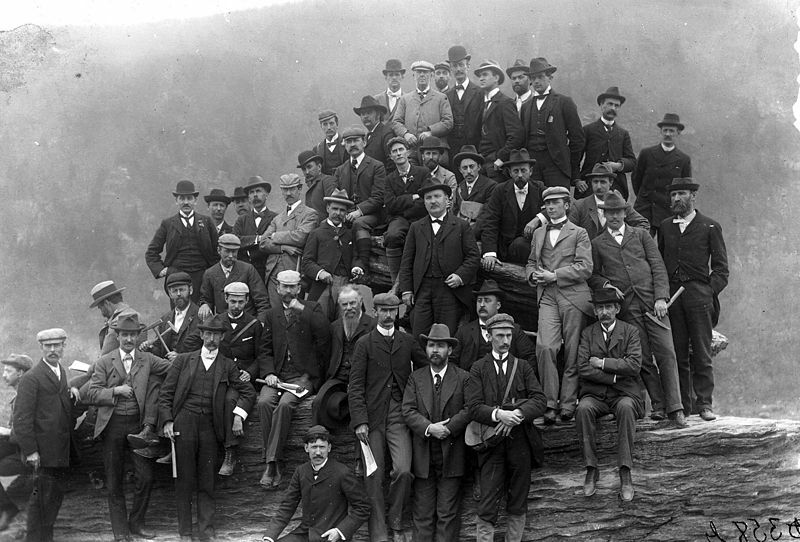 Go ahead and chuckle, my non-geologist friends, but this is how some rock identification is accomplished. 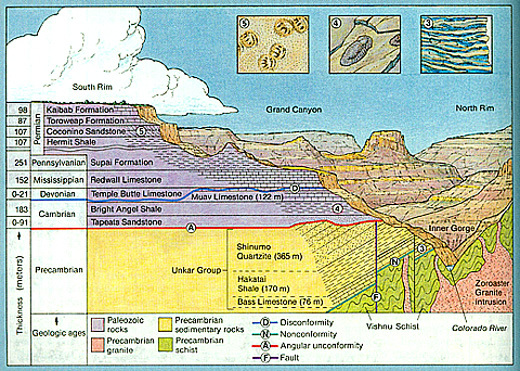 Original Horizontality and Superposition- This is the idea that rock layers are deposited in a horizontal fashion with the oldest rocks being on the bottom and the youngest being on the top. This generally holds true unless you’re dealing with thrust faults that shift and bend layers. Cross-cutting relations- If a geologic feature such as a volcanic dike or fault cuts across other geologic layers, then those cut layers are older than the layer doing the cutting. A similar principle involves that of “baked contacts”. If you have something like a volcanic sill or dike that injects magma into the local bedrock, then the border between the dike/sill and bedrock will experience some thermal changes, or metamorphism. This injection of magma is called an intrusion and can be inferred to be younger than the surrounding bed rock. Disconformity- This is where you have two layers of sediment parallel to one another, but were not deposited one after the other. This could occur when a layer of sediment is deposited, is slowly eroded away and another layer of sediment is deposited where the old one used to be. Nonconformity- These are present where you see a layer of younger sedimentary rocks on top of older intrusive metamorphic or magmatic rocks. This ties directly into the principle of Cross-Cutting Relations and “baked contacts”. If you have a layer of, let’s say river sediments, deposited on top of a dike (magmatic intrusion), then you have a nonconformity. Angular unconformity- This occurs if the older bottom layer of rocks has been tilted at an angle and the younger top layer is relatively horizontal. This is also called Hutton’s Unconformity, and a well known example is Siccar Point in Scotland. These concepts give geologists a relative age of the rocks they’re working with. It’s not meant to give a conclusive age, but rather constrain the time line that we’re working with. If we want to obtain an actual age we turn to radiometric dating. This form of dating gives us an absolute age value that allows us to assign a numerical value to the rock layers. While decidedly more sophisticated than relative dating, this is a technique that is most familiar to the public and also the least understood. Radiometric dating involves the measurement of isotopes. An isotope is an atom that has an unequal ratio of neutrons to protons (Edit: In my efforts to simplify the chemistry behind radiometric dating, I used a definition of isotope that is not entirely true. An isotope, such as carbon-12 which has 6 protons and 6 neutrons, can have an equal ratio of protons to neutrons. A couple readers pointed this mistake out. I posted those comments in the comment section for clarification). This makes the atom pretty unstable and causes it to undergo radioactive decay whereby it becomes the atom of a different element. For example, the atom that allowed us to determine the age of the earth, uranium 238, decays into lead 206. The original atom is called the parent isotope and the new atom is called the daughter isotope. The amount of time it takes for a parent isotope to decay into a daughter isotope is called the half-life. This decay occurs with regularity and allows us to obtain an accurate age of the rocks we’re studying. To clarify this example, and pick up with our Doctor Who theme, let’s imagine we have 32 Daleks. In one hour 16 of those Daleks decay into Cybermen. Another hour passes and 8 of the 16 remaining Daleks become Cybermen. After those two hours we have a total of 8 Daleks and 24 Cybermen. At the start of the third hour 4 of those poor Daleks have gone over to the Cybermen side. For an explanation of what happens when there is less than one atom present, click here. Now, this is a highly simplified explanation of a rather difficult process. Truth be told, there are some beastly equations that deal with this decay process, but the idea is relatively straightforward. However, isotopes do have their limits. For example, carbon dating has a limit of about 60,000 years and as such is excellent for dating human artifacts and fossils, but not so great for volcanic rock. Beyond that 60,000 year mark it becomes wildly inaccurate and we need to use atoms such as Uranium 238. This is the atom that has allowed us to determine that the earth is 4.5 billion years old and not 6,000 years. The Geology 101 series is an idea I’ve been kicking around for some time now. The reason for this is two-fold: to communicate the basic underpinnings of geology to the public and to keep those concepts fresh in my mind as I continue my own studies. However, it seemed like such a massive undertaking that I wasn’t sure where or how to start such a task, so I put it on the back burner. And then, my dear friend Dana wrote this. (I’m not going to summarize her excellent post because I can’t do it justice. Just read it and thank me later). I knew I had to dust off the Geology 101 series, not just for Dana, but for all those who want to learn more about the earth and its comings and goings. I’m still unsure on how to convey the grandeur of the earth sciences, but I have my trusty Essentials of Geology by Stephen Marshak to give me some ideas. I’m planning for this to be once a week like Meteorite Monday, but that could change depending on my school/work schedule. With that being said, let’s get to the fun stuff! We’re going to start at the beginning- not with the formation of the earth, nor the solar system, but the universe itself. This may seem like a strange starting point, but you need an idea of how it all truly began to appreciate how the earth came to be. 14 billion years ago (and not 6,000 like some cranks teach), soon after the Big Bang, there existed a whole lot of hydrogen, some helium and probably a smidgen or two of lithium floating about. These atoms formed the first stellar nurseries, what are commonly referred to as nebulas. Of course, it’s much more complicated than that, but I’m not an astrophysicist so I’m not going to delve into the details. So, if you want a better explanation I’m going to suggest you watch this video from our friend Carl Sagan. These nebulas began to churn out the first round of stars. As these stars grew, they began to form heavier elements. At the end of their life-cycles, these stars became supernovas. Stephen Marshak writes that this violent end is how elements heavier than iron are formed (P.16). As the stars went supernova, the elements were peppered all across the solar system. Then the process repeated. More stars formed, created heavier elements and became supernovas just like the previous generation. This continued on and still continues today. This is the material from which we and our earth were formed. To quote Carl Sagan “We are all made of stardust”. Approximately 8 billion years after the Big Bang our solar system began to take shape. At this point it was just a huge disk of gravity bound dust and ice that circled around our proto-star. This is referred to as an accretionary disk or protoplanetary disk and can actually be found throughout the universe. Gravity began to pull this space dust together and form planetesimals (or baby planets, if you will), in a process called accretion. These nascent planets grew by sweeping up other pieces of rocky material in their path. A few of those planetesimals grew large enough to develop iron cores in a process called differentiation. Wanna hear something really interesting? As I’ve mentioned in other posts, iron meteorites represent the core of these planetesimals. Currently, there are 26 different types of iron meteorites and some researchers have suggested that these came from 26 distinct planetesimals. However, most of these planetesimals didn’t survive the turbulent beginnings of the Solar System. In a game of galactic bumper cars, the planetesimals collided with one another and broke apart. Some of this material reaccreted (or came back together) to form brecciated asteroids such as Itokawa. All this left over building material can be found in the asteroid belt, a planetary graveyard of sorts. I’m not going to speculate much on the formation of the gas giants. That’s beyond the scope of this post, but I will leave you with some nice tidbits of info that I’ve picked up in my studies. It’s been suggested that the formation of Jupiter could be responsible for Mars’ stunted growth. Any material that Mars could have swept up to increase its size was taken by Jupiter’s immense gravitational influence. This would suggest that Jupiter probably had a head start in its formation if it had sufficient gravitational force to sweep up the potential building blocks of Mars. But this is all speculation so, if your curiousity is piqued, I would suggest starting with Wikipedia to suss out some of the material. So, with the creation of our Solar System, and subsequently our earth, out of the way I’m going to wrap up this first installment of Geology 101. Feel free to leave your questions or even suggestions for future topics in the comment section below.